The office is located in a modern office condominium complex on New Road, which is conveniently located between Route 280 and Route 46 in Parsippany, NJ. The office prides itself in working with patients' busy schedules, having hours on Saturday and a late night on Tuesday. Utilizing the latest equipment and materials has allowed me to achieve great clinical results in a pain free environment. 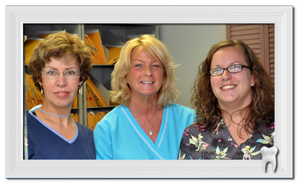 The office is designed for patients wanting personalized dental care. My office manager, Patti, handles efficiently all the insurance and scheduling of the office and has been with me for over 16 years. Vicky my hygienist always manages to do a thourough job with a soft touch and has been with my office for 15 years. My chairside assistant is Lyndsay who always knows how to comfort an anxious patient. She has been at my office for 4 years. Over time the staff has made a bond with my patients who say that they like the relaxed friendly atmosphere they feel when they come to the office.